All transactions are safe and secure with a reliable history in online purchasing behind each of our associates. 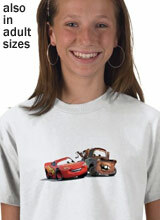 Buy the Lightning McQueen and Tow Mater t-shirt to own Cars clothing and merchandise. After the Piston Cup, Mack accidentally loses Lightning McQueen on the way to the tiebreaker race. The rookie red racecar ends up in the forgotten town of Radiator Springs. One of Lightning's first acquaintances is a rusty old tow truck who goes by the name of Tow Mater. The two become friends and Mater introduces McQueen to tractor tipping and demonstrates his ability to drive backwards at ultra fast speeds, a skill that Lightning later uses in the tiebreaker race. Support these two BFFs with this McQueen and Mater t-shirt featuring both of them. In addition to the Lightning McQueen and Tow Mater tee above, browse the Cars Clothing Gallery for more apparel like men's and women's clothes, kids shirts or hoodies.